Te was one of the very first women hired in the LandMine Design program. A middle-aged mother of three adult children, she was a bit of a pre-madonna in the early days of our program. Te’s emotions would often get the best of her and sometimes found an escape in the stinging words she would speak. A natural leader, she became a predominant figure in the program which gave her a platform from which to relate with little restraint. For Te and the other women, working and living in a minefield in close proximity to each other means privacy is non-existent. The ladies of LandMine Design know pretty intimate details about each other and with that knowledge comes the power to use it against one another. Te was no stranger to using knowledge to hurt others during those early days. Her words would often penetrate deep wounds into the hearts of many of our women. However, after months in the LandMine Design program, a shift slowly began to happen in her heart. 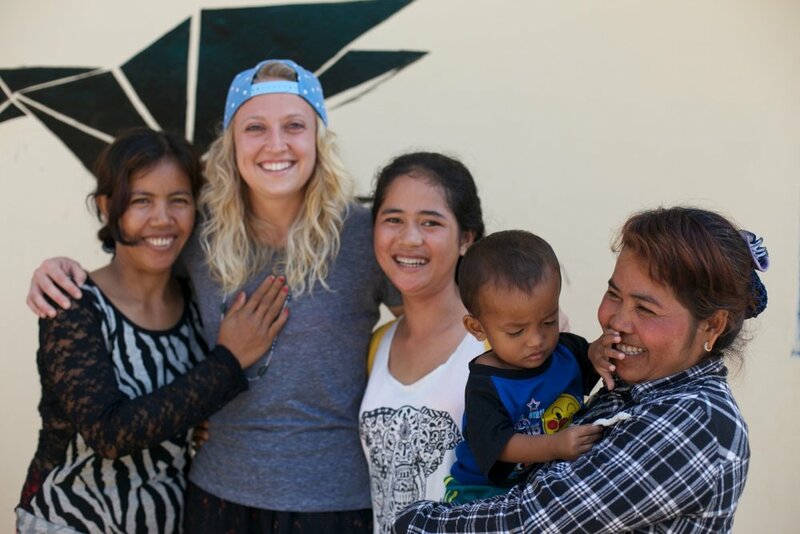 Not only was Te earning a much-needed income by producing pretty jewelry; through the lessons being taught and the examples of our managers and staff, Te was also learning better ways of handling anger, gossip, and relational issues. The process was slow as Te and other women had to be gently confronted about the toxic ways they were relating to each other. Those meetings were (and are) long and sometimes quite tearful; but slowly Te and the other women began learning a new way to relate — a way that included compassion, honesty, honor, forgiveness, and mountains of grace for each other. Watching Te learn to bite her tongue and respond in kindness rather than bitterness was truly beautiful to see. During this past year, the things Te has been learning at LandMine Design have seeped into her own family as well. Her relationship with her husband began to experience healing and growth in tender, positive ways. Te also began to really notice others and bring their needs and problems to our attention. She would come to LandMine Design meetings in tears over the desperate needs she saw of other villager's. In all honesty, we couldn’t believe the transformation we were witnessing in her compassion for others. Te was looking beyond herself and realizing she could influence her world for good through her compassion and new ways of relating. That compassion grew to a crescendo a few months ago when she was approached by a young mom with a baby from a nearby village. Literally starving and lacking the ability, family support, emotional stability, and resources to care for her baby, this young mom was desperate to find a home where her son could be adopted. By this time, Te had become well known in the area for her compassion and work in helping others. This young mom knew Te could help her find a loving home for her infant son. Brokenhearted over this mom’s plight, Te met with her on several occasions trying to find a solution. During those meetings, Te’s heart softened even more, and so did her husband’s. After many discussions, Te and her husband sensed a calling to step up and be the ones to adopt this new baby boy. Te and her new baby boy! It’s hard to imagine, isn’t it? A bitter woman who had already raised her children and lives in a minefield, could experience such deep transformation that her life has become radically changed. One who once used harsh words to erode hearts, has now become one who sees and chooses to respond with compassion rather than toxicity. Don’t get me wrong - Te still has her moments when the old ways surface, but her new way of living is having a radical impact on her life and those in desperate need around her. As for her newly adopted son, the change means a new life. From within the border town where human trafficking is completely common, something uncommon and hope-filled is happening. Women, like Te, are prevented from facing the horrors of human trafficking. But it doesn’t stop there. They are also learning a new way of living, relating and loving. This new way is helping to propel the prevention of human slavery from becoming realities in this village. The new way is multiplying itself and helping to prevent people, not even involved in the program, from being forced into human slavery. At LandMine Design, we’re working to prevent human trafficking. At the same time, we are seeing the inward character of many being changed and transformed. I hope that encourages you today… it sure encourages me! As I type these words, the necklace hanging around my neck was made by Te. I’m thankful to be a part of Te’s story. I hope you will be encouraged to be a part of Te’s story and the stories of many more women by choosing to buy and wear the beautiful pieces they create. Together, we can be a part of preventing human slavery as well as the transformation happening in a village on the edge of Cambodia.